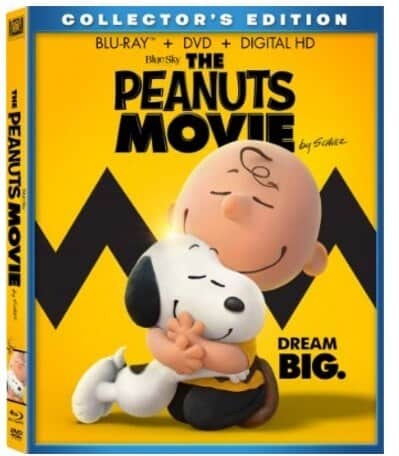 The The Peanuts Movie [Blu-ray] is on sale right now for $9.99 at Amazon. That's 67% off the list price of $29.99! DREAM BIG AND LAUGH ALONG with good ol Charlie Brown, Snoopy, Lucy, Linus and the rest of the beloved Peanuts gang as you ve never seen them before in a brand-new feature film from the imagination of Charles M. Schulz and the creators of Ice Age. Join everyone s favorite eternal optimist, Charlie Brown, as he embarks on a heroic quest, while his beagle pal Snoopy takes to the skies to pursue his archnemesis, the Red Baron. It s a hilarious and heartwarming adventure that proves every underdog has his day!